This convention is used if you are looking to bid for a slam. There are two types of slam, a small slam and a grand slam. The reason you will want to bid for a slam is simple – points! If you bid for and achieve a slam you will gain a huge points advantage. As a general rule, you will be considering bidding for a small slam if you have around 31+ points in a suit contract – and remember this could include shortage points. This means aces are key. You could be missing two aces between you and partner and still have a point count of 31+, or missing one ace and still have enough points to consider bidding for a grand slam. You need a way to find out if you have enough aces between you, otherwise the opposing partnership could have two certain tricks and your bid of a small slam will fail. This is where Blackwood comes in use. It is a way of asking partner how many aces they hold. 4NT isn’t a bid that would normally be used. 3NT is enough to bid for game, so 4NT can be used as an “artificial” bid – it asks your partner to tell you how many aces they hold. 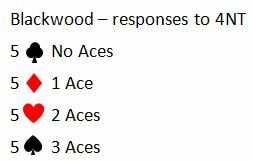 Partner’s response tells you the number of Aces held. If you need to know how many Kings partner holds, you use a bid of 5NT. The responses work in the same way as when asking for Aces. Use Blackwood once you have decided on the suit (or NT) that the contract will be played in. The most common exception is after an opening bid of 1NT or 2NT where we could have enough points for a slam bid. A direct raise to 4NT isn’t asking for aces, it’s an invitational bid. It tells partner you have a narrow points range that will achieve the necessary points for a small slam IF partner has maximum points for their NT bid. So you are asking partner to raise to 6NT if they have maximum points for their NT bid, otherwise to pass. Suppose the opening bid was 1NT or 2NT and you know you have enough points but need to know how many aces or kings partner has. You can’t use 4NT as after a NT opening bid, this would be an inviational bid not Blackwood. What can you do? This is where the Gerber Bidding convention is use. Instead of bidding 4NT, you use 4Clubs instead. 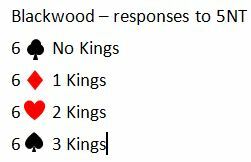 The responses are the same as the responses for Blackwood. If you then need to know how many kings partner has, you can use the Gerber bid of 5 Clubs. If you join No Fear Bridge for your two week trial membership (no obligation, no financial details taken) you can practice using the Blackwood and Gerber bidding conventions and study the handouts and tutorials. American Standard players join HERE. Is there a response/bid to show partner that you have one ace and a ace/king in response to a 4 NT bid? @ Shirley. That isn’t necessary, I think. If partner bids 4NT s/he is asking for aces. If s/he also needs to know how many kings then s/he will bid 5NT to ask that question.